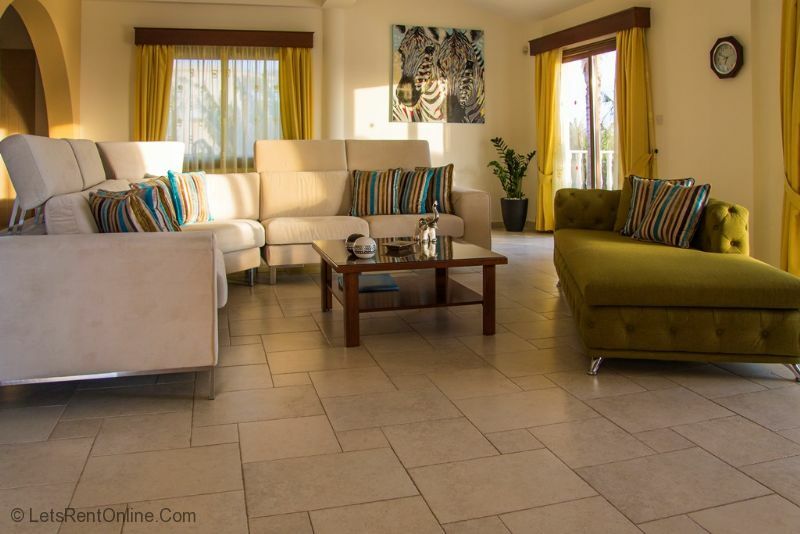 This newly re-furnished and impressive luxury 4 bedroom, 4 Bathroom villa is situated in a prime position just 100m from the Sea amongst the banana groves in the affluent suburb of Sea Caves. 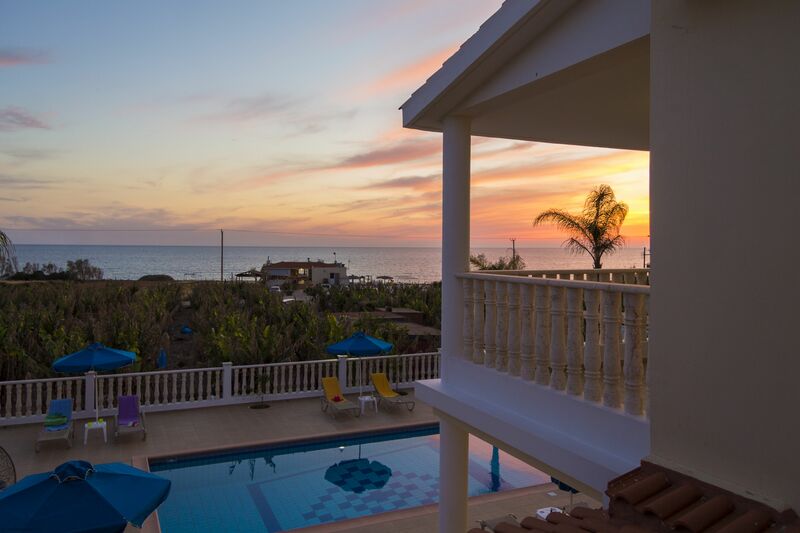 Most areas of the villa offer beautiful views of the clear blue waters of the Mediterranean Sea, as well as views of some of the most stunning sunsets the island has to offer. 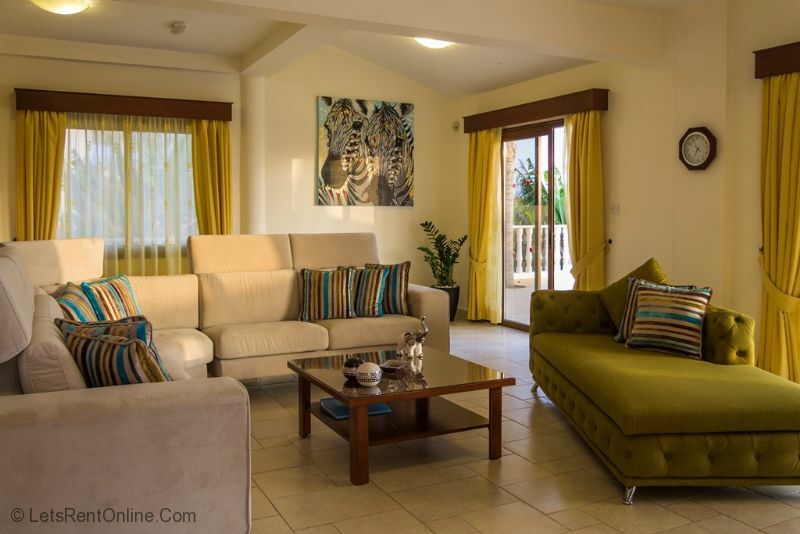 This ideal holiday villa is tastefully and elegantly furnished over 2 floors and is equipped to the highest standard. 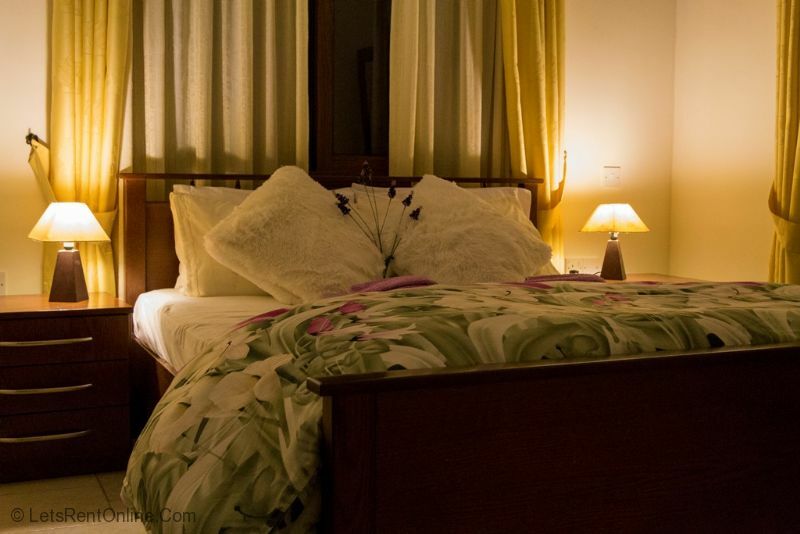 Much of the interior consists of handcrafted wood with good attention to detail and lavish furnishings surrounding. 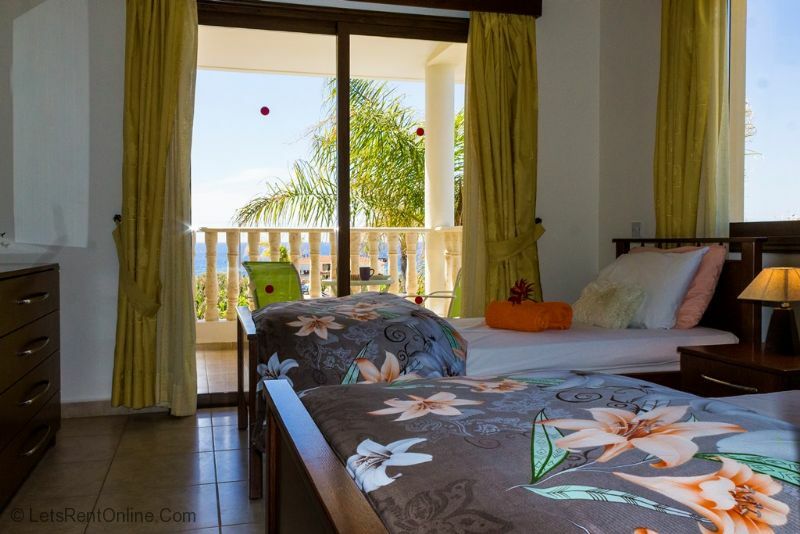 The main facilities include Satellite TV, DVD, Wi-Fi, Full Air-conditioning available in all rooms, dishwasher and a fully equipped kitchen. 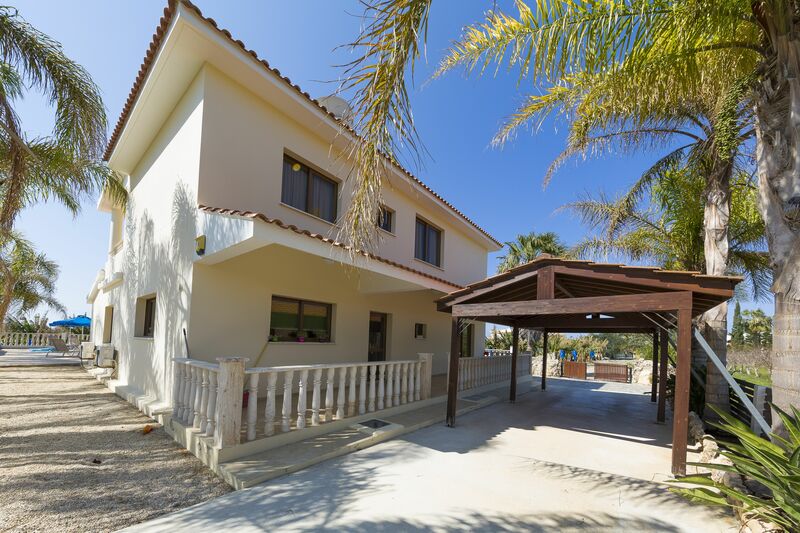 Combine this with the 9m x 5m private with Roman Steps, sofa set under the pergola, outdoor basket chair, table and chairs to seat 8 outside for alfresco dining, table tennis as well as the 8 sun loungers and quality parasols, you cant help but have a great holiday at Villa Marianna, Sea Caves, Paphos. 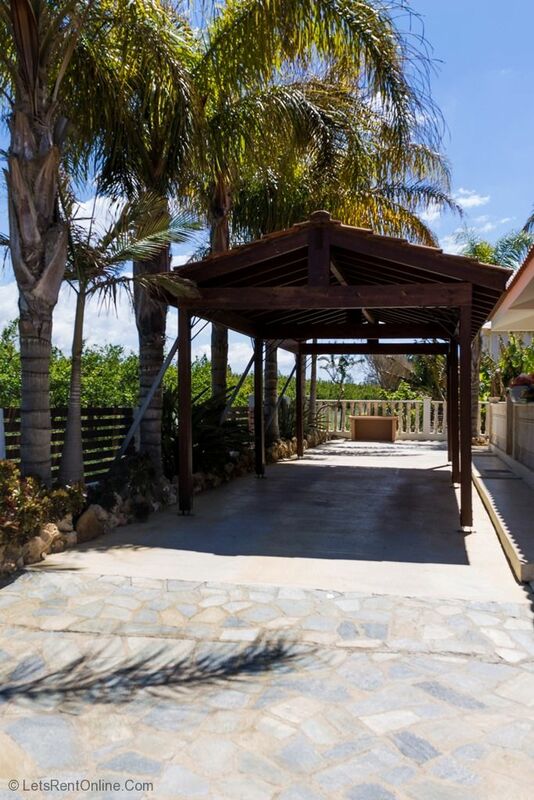 On entering from the grand entrance doors you immediately gain a sense of space, serenity and luxury. 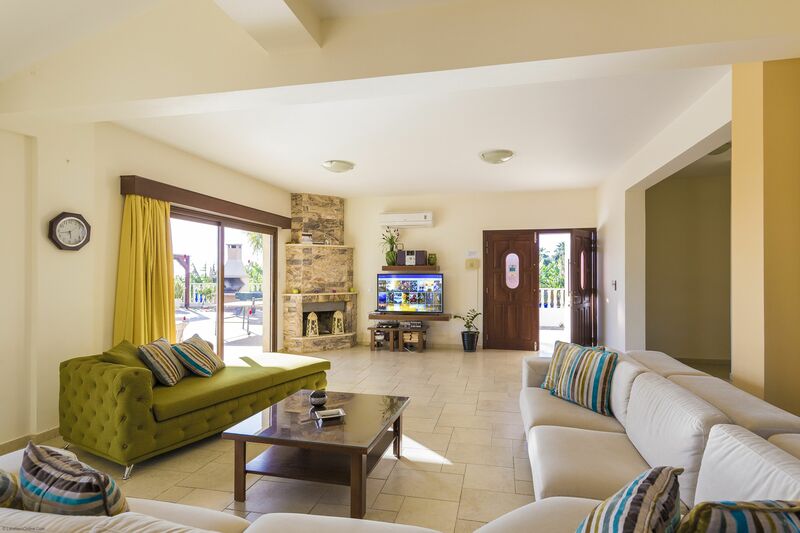 The spacious open plan living area features a working fireplace and is furnished with a modern L-shaped sofa, with entertainment being provided by the large 50 inch flat screen television with Satellite, DVD player and CD Player. The sofas as you can see are far from basic and everything is very luxurious. The hand crafted wood designer kitchen is fully equipped with an electric oven hob, large American style fridge/freezer with water cooler, microwave, dishwasher and washing machine. 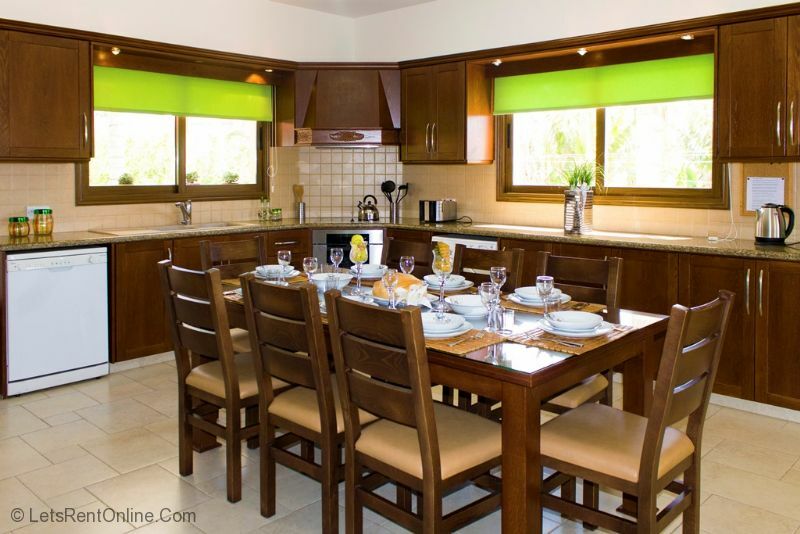 The dining area features a large wooden dining table and 8 high backed dining chairs. 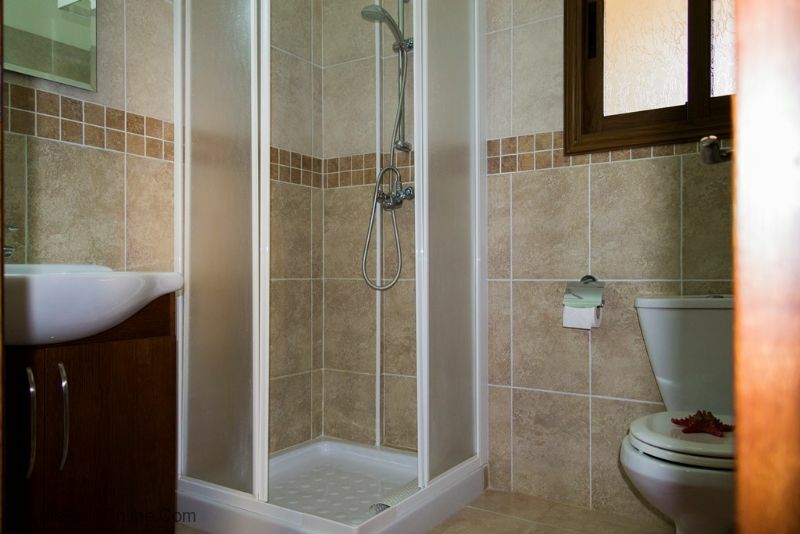 Making up the ground floor is 1 double bedroom with en-suite shower room and a useful cloakroom. A tiled staircase leads to the first floor accommodation where the master double bedroom with en-suite bathroom is located. 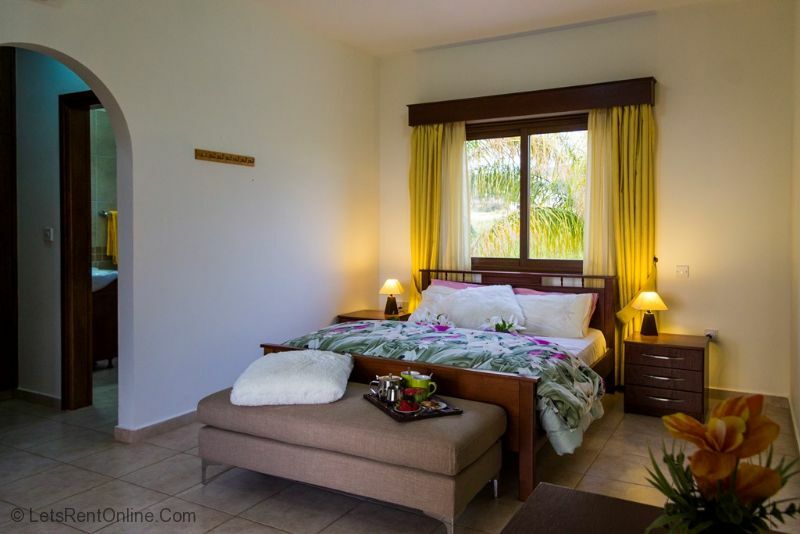 This room features a generously sized private balcony boasting spectacular views across the private pool, banana plantations and out to sea. A baby cot and high chair can also be supplied upon request. 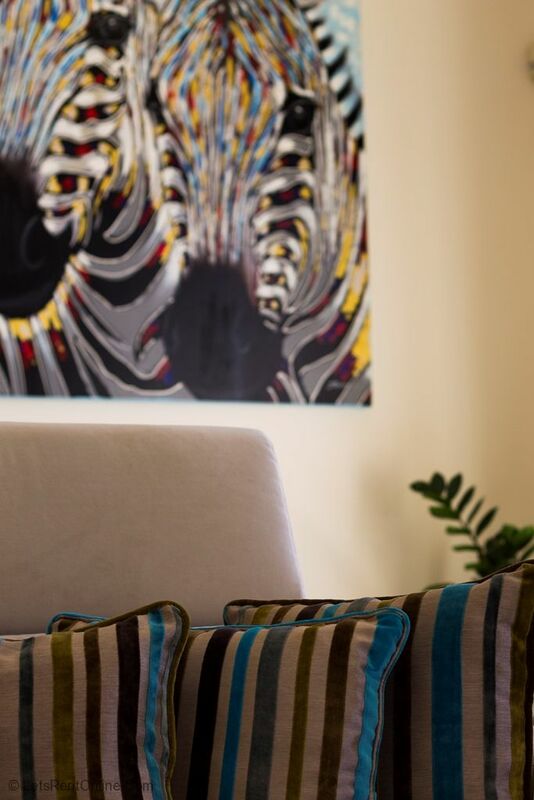 Air conditioning units are installed in each of the bedrooms and their use is included in the rental rate (living areas paid locally if required). Wi-fi is included in the rental rate and fast enough to allow video streaming. 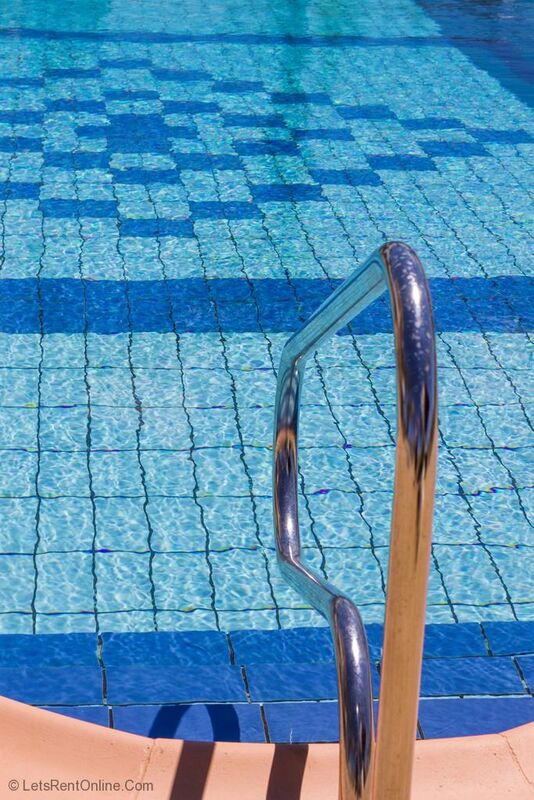 Outside the 9 metre x 5 metre private swimming pool with both walk-in Roman steps and handrail is surrounded by a substantial sunbathing terrace equipped with sunbeds, umbrellas and a poolside shower. The brick built barbecue area and outdoor dining set to seat 8 makes it a perfect area for alfresco dining. 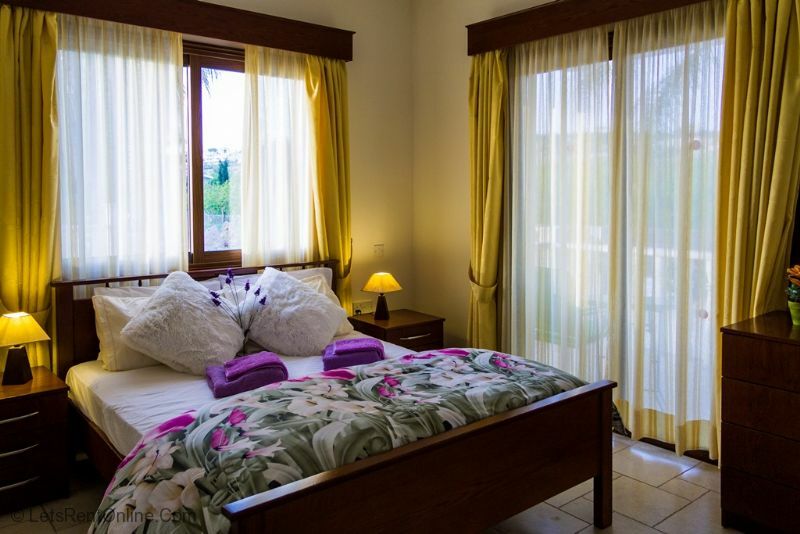 Immediately surrounding the villa are carefully landscaped areas abundant with palm and banana trees as well as colourful and fragrant flowers. 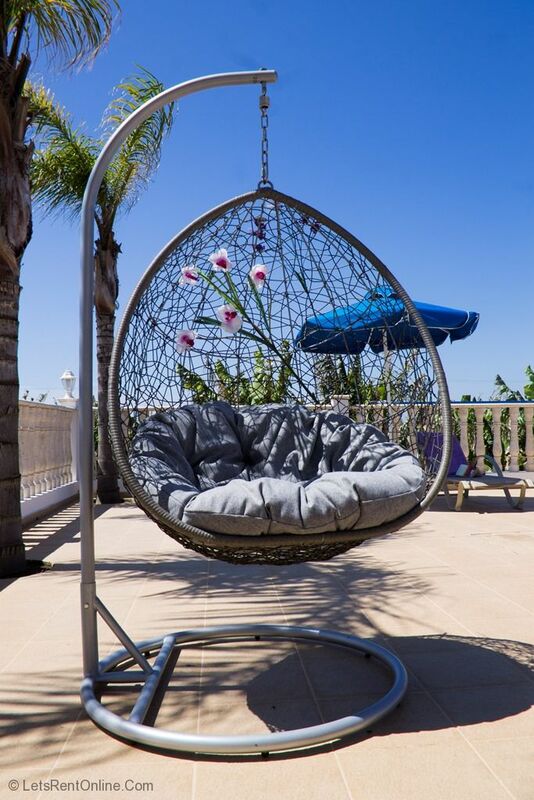 A hanging basket chair is a feature of the pool area to allow for complete relaxation. 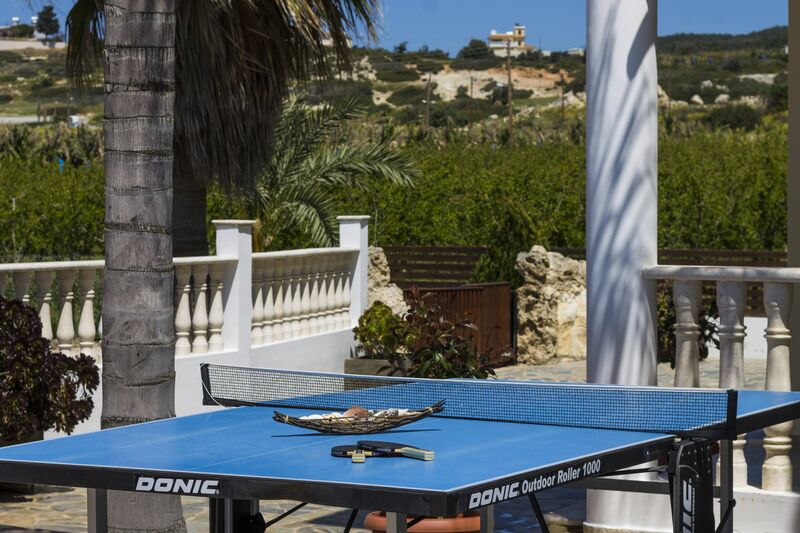 For the more energetic there is a table tennis table available also. 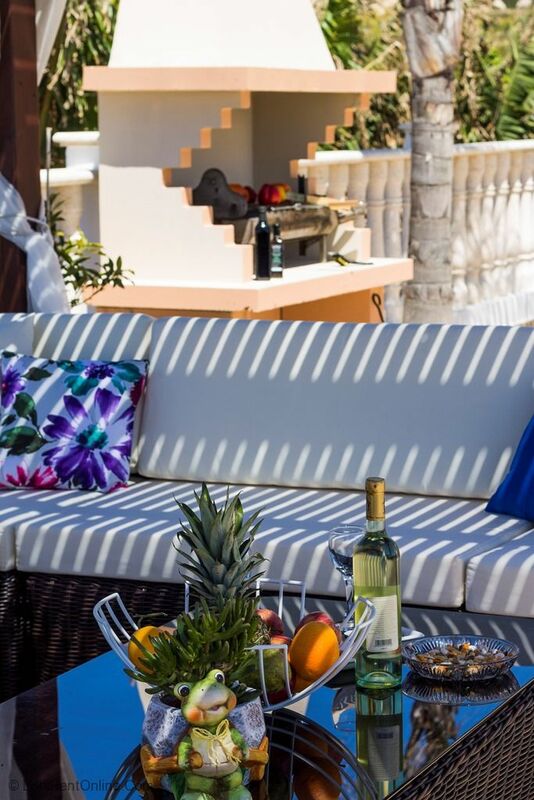 The corner sofa set under the handcrafted pergola allows for casual coffees, pre-dinner apertifs or maybe just sitting with a book watching the world go by in the beautiful Cyprus sunshine. Please pass on my thanks to the owner. 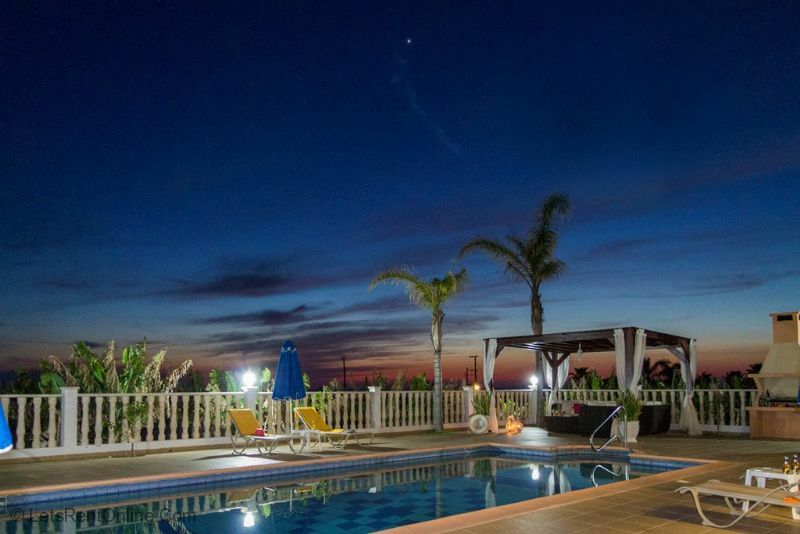 My family and I have done many Cyprus villa holidays over the last 10 years. (many of them through James villas). 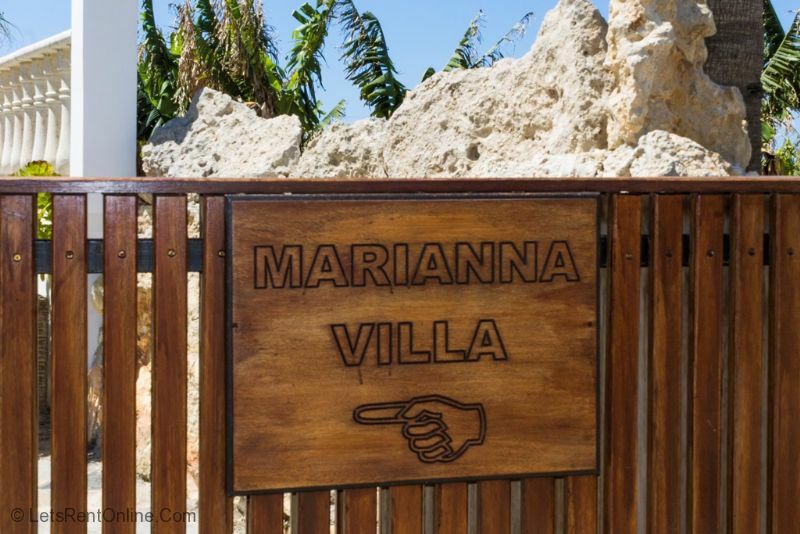 Villa Marianna is the cleanest and best presented I have used. 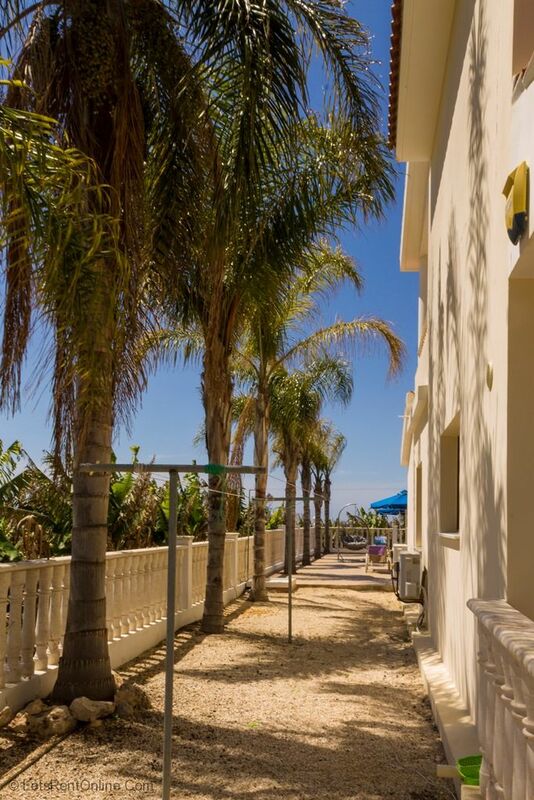 The lay out of the pool area is very generous and well thought out. We recommend Oniro's which is quite local worth a visit. Doria restaurant is nice and one of the few left that has a Cypriot feel about it. The hospitality is excellent and has a great menu. 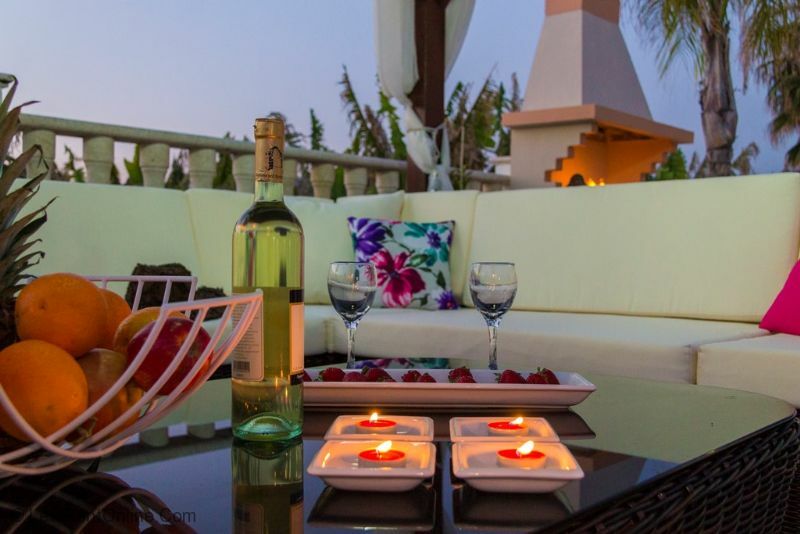 The Villa was absolutely stunning and everything we had imagined from the previous reviews. The location was perfect for what we wanted, peaceful, quiet and secluded. But also had enough great places you could visit in a short radius. Highly recommend future guests hire a car or two like we did, this saves you always needing taxis and due to the location, it will help with shopping and day to day exploring. On vehicles though, if they want to go off the beaten track, I suggest a ATV type of buggy, as a Normal car may struggle on a lot of the roads in the hills and along the coast. If they hire a normal car, stick to main roads only. Sea caves Taverna just in front of the Villa is a great place, with friendly staff and good food. Not to mention the the views and lovely bay you can swim in. Another Taverna we found a few Kilometres towards coral bay, is the Oniro Tarverna. Food quality and service here is amazing and well worth a trip down to. Once again views were stunning, with the ship wreck right next door to look at too. Highly recommended. Would recommend a trip to Latchi beach / Harbour. And take a boat trip. We used Alkion II , 3hrs trip in total with glass bottom and swimming for an hour in the middle. Didn’t see lots of wildlife but being on the boat and swimming was amazing. Got a deal for €13 a head. Supposed to be €20. 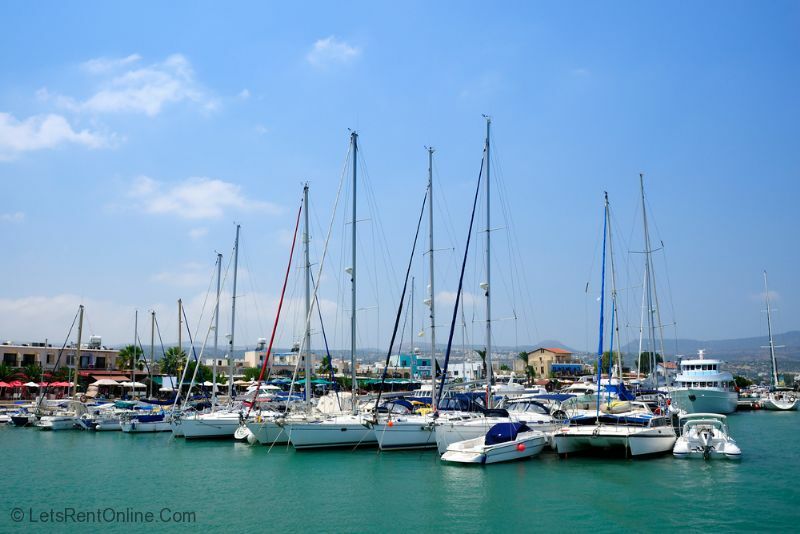 In Paphos / Pafos, we went on the Jolly Roger boat as well. This was fun and friendly with drink included. I think your service has been Fantastic, very quick responses of all my questions and great information given to me before the trip.The owner, Christina, was nice and friendly and she answered all our questions we had for her. I would definitely rent another villa and I would definitely look at yourselves first to book through in the future. 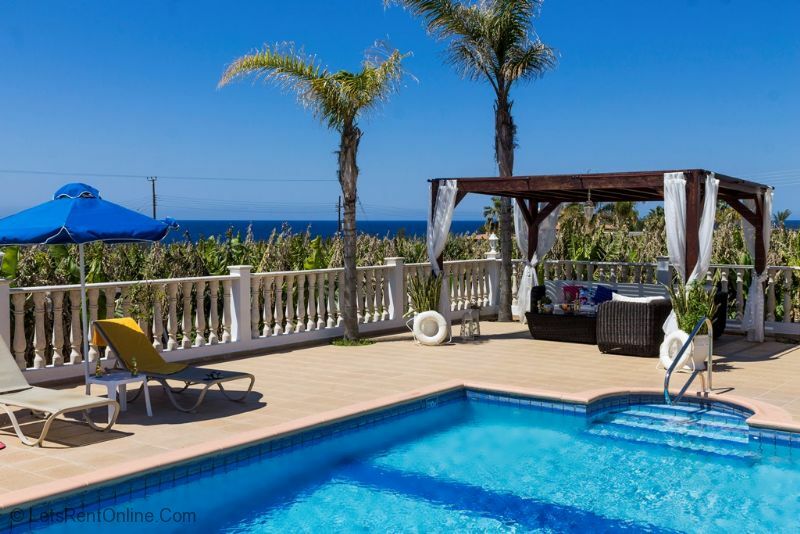 ''We had a fantastic holiday and the Villa was perfect for us, the quality of accommodation made my 50th a truly memorable occasion.. The management team were helpful and the cleaning was great. Thank you so much, I would happily recommend your villa to anyone. 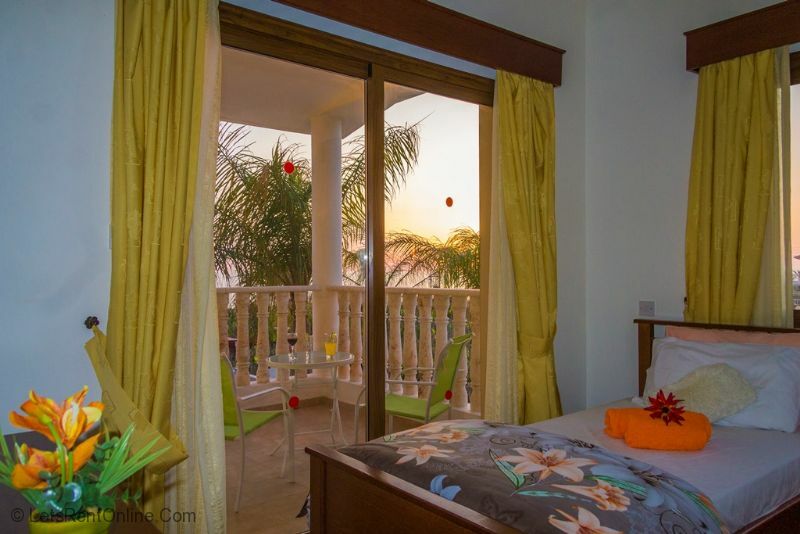 The villa was Excellent, the outside area was fantastic and the bedrooms were just right. The overall standard of the accommodation was great. You would need a car but it's close to the caves and the restaurant is only 100 metres away, quiet and peaceful we loved it. 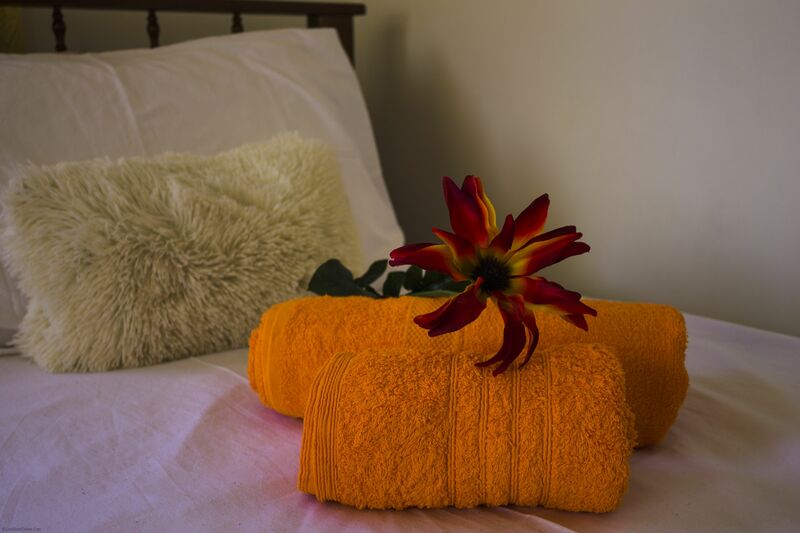 ''Regarding feedback, the property was superb - lovely open-plan lounge with very comfortable seating, well equipped kitchen, extremely clean, well appointed bedrooms. Good parking facilities for our 3 vehicles. 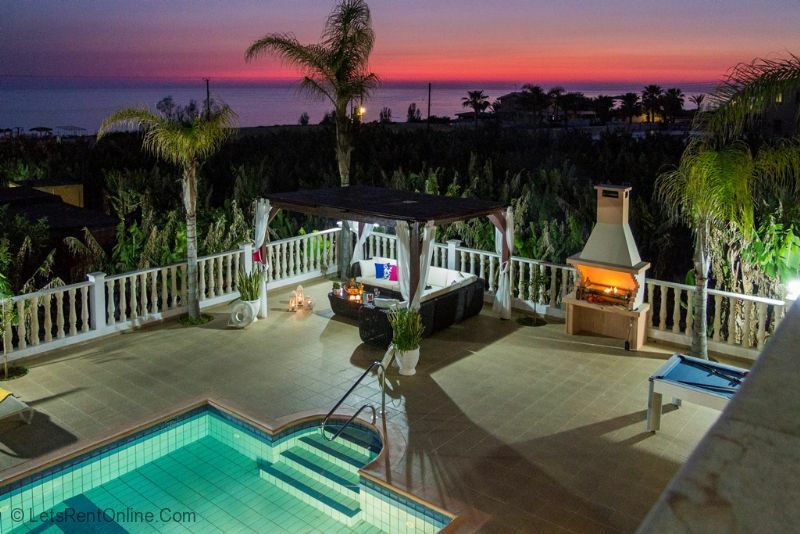 The location was beautiful, Amazing sunsets from the villa. Paphos old town - We went to a superb restaurant - unable to recall the name, but wonderful mezzes. 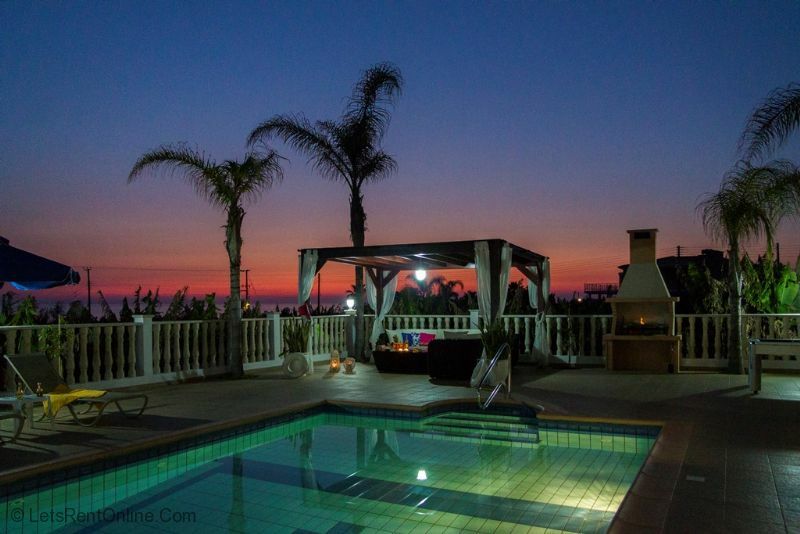 We were with Paphos-based family most of the time, so had many family get-togethers. 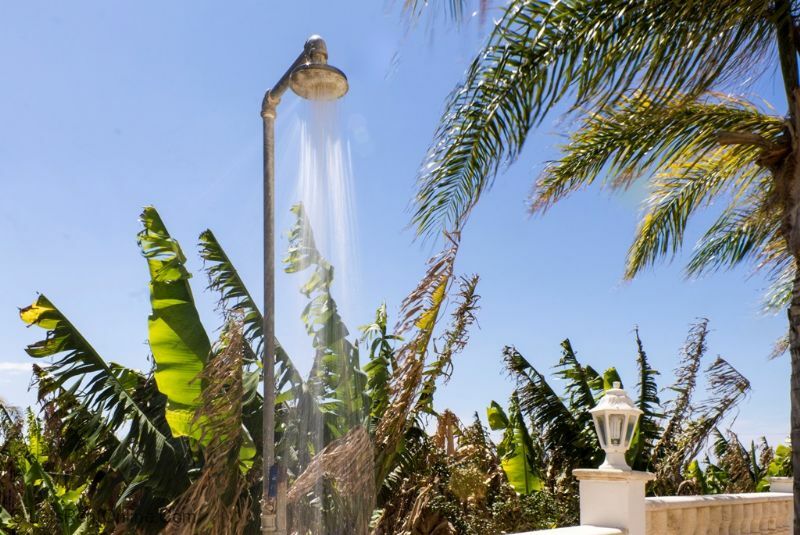 ''Very nice villa located in a banana plantation. We loved the location because we were looking for something outside the crowded locations. 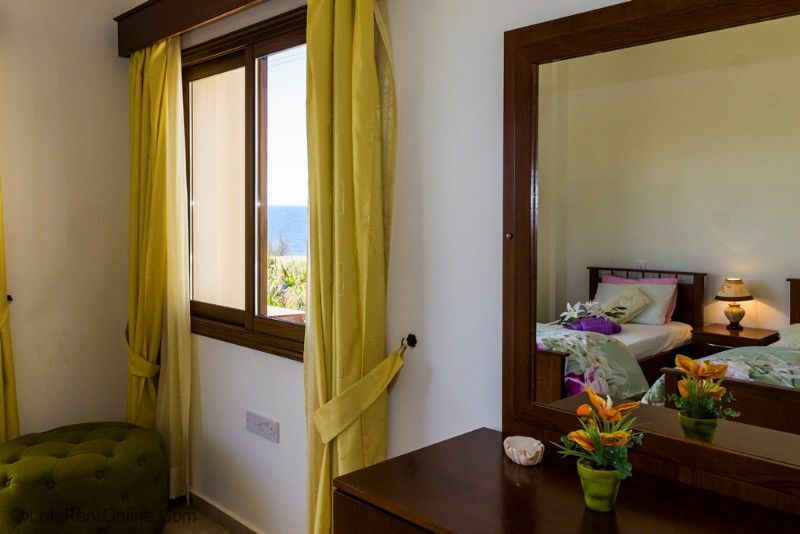 In a couple of minutes you are at Coral Bay and there is a great supermarket not far from it, called Philippos. 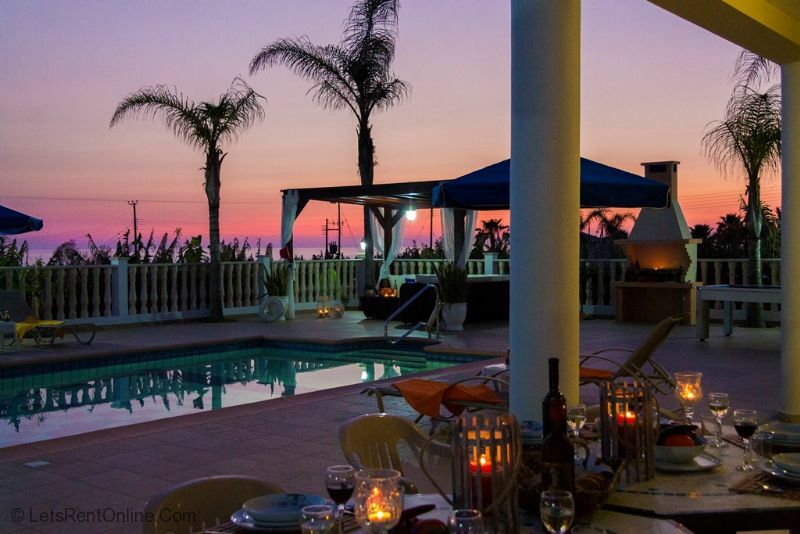 Next to the house is the Sea Caves Restaurant with incredible view and sunset! 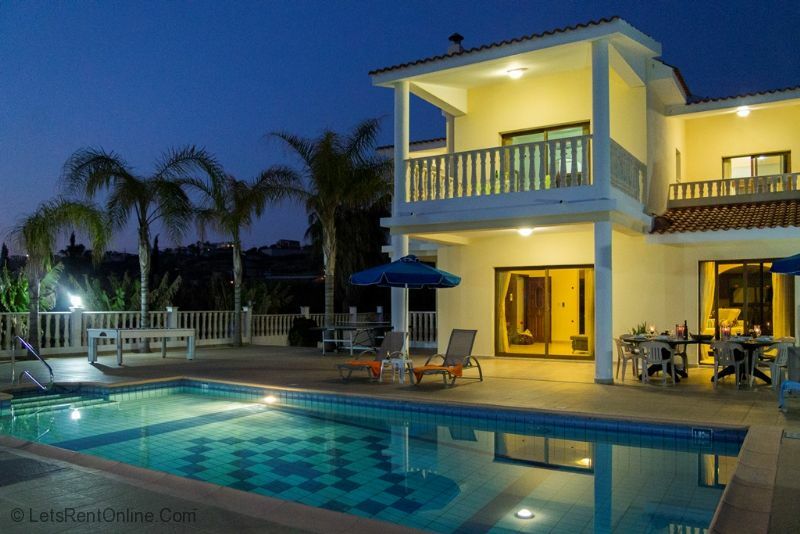 This prime positioned holiday Villa is within an affluent area known as 'Sea Caves' and the Akamas Peninsular, a protected area of outstanding natural beauty, yet still close to the resort of Coral Bay (4km) and Peyia Village (3km) with their diverse range of traditional and modern bars, cafes, tavernas and restaurants. 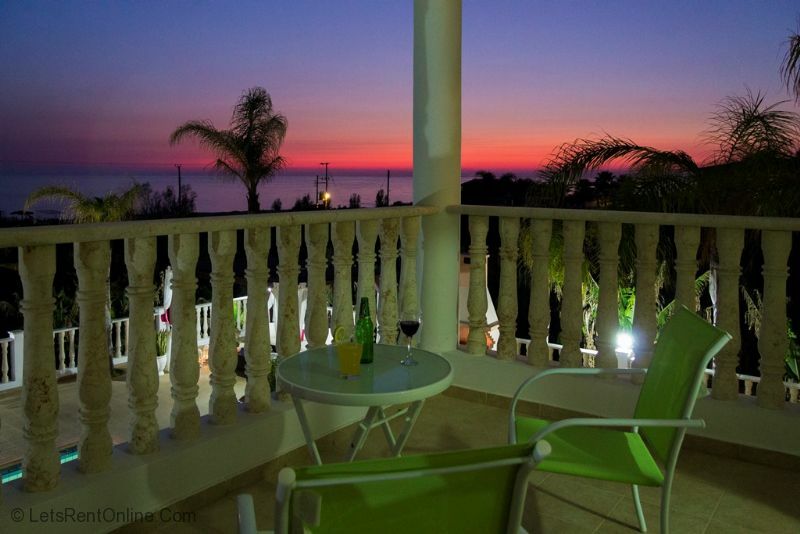 The property is but 50 metres from one of the best known local tavernas in the area which provides good food, hospitality and views within a peaceful and relaxing setting, next to one of the areas many impressive banana plantations. 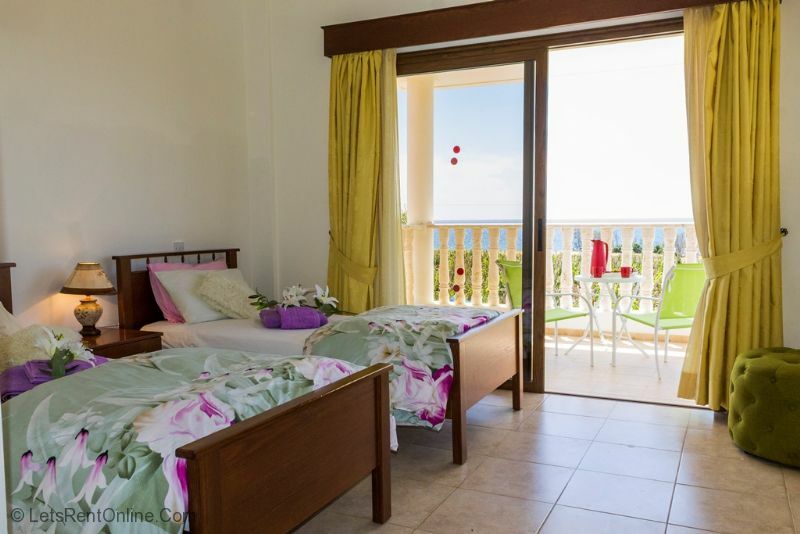 The Sea Caves taverna has undergone recent renovations and upgrades and provides a beach bar and childrens play area. 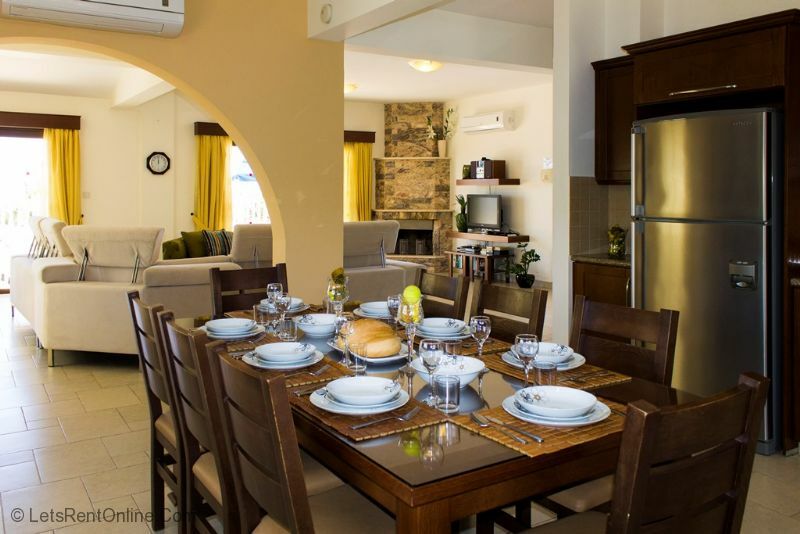 We would add that it is still a quiet family taverna and should not cause any disturbance to your tranquility. 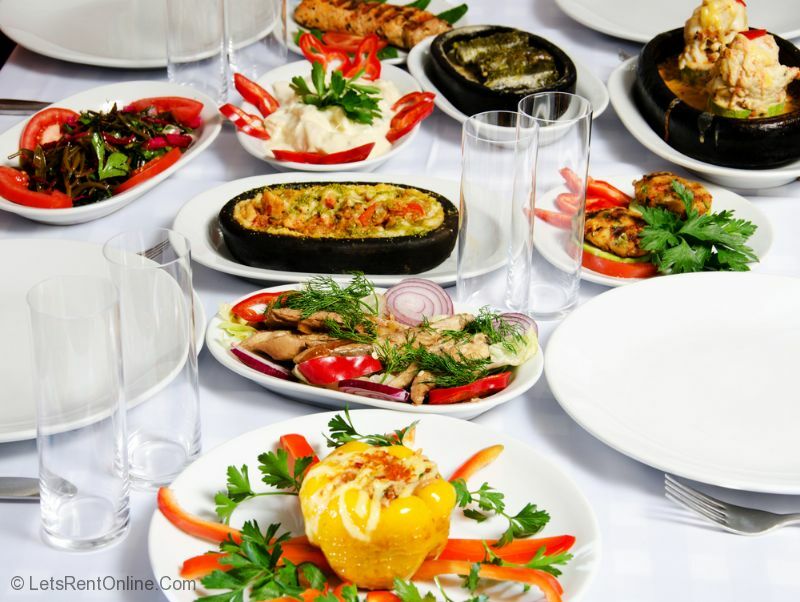 It is easy to walk to other tavernas and cafes more of which have sprung up in recent times. 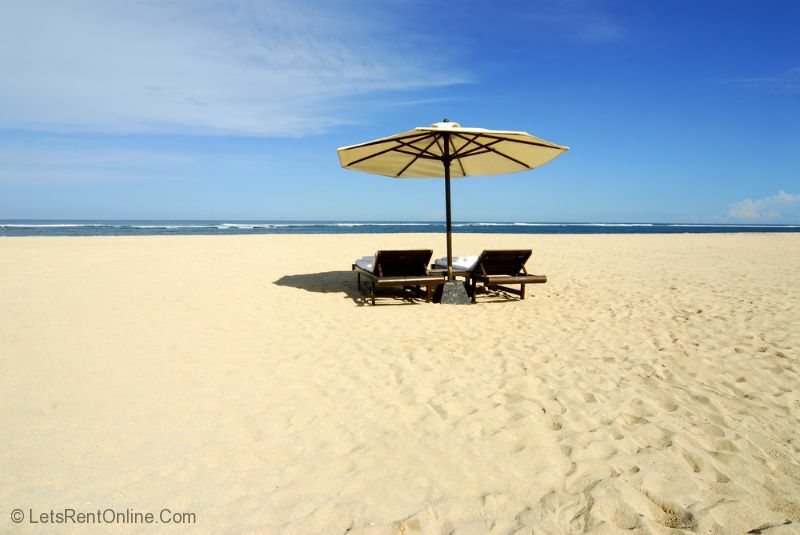 The most famous is Oniro by the Sea which provides great food and service in a very ambient setting. 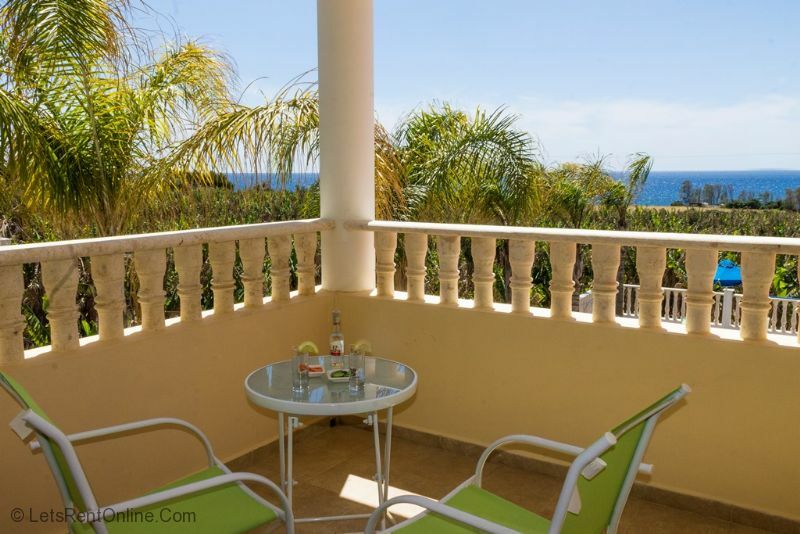 There is a choice of small beach areas in walking distance of the villa. Some you may find you have to yourself and there are plenty of spots to access the water for swimming and snorkelling. The Sea Caves area, like much of Paphos, was once rural and barren land but over recent years the Sea Caves area has changed dramatically. 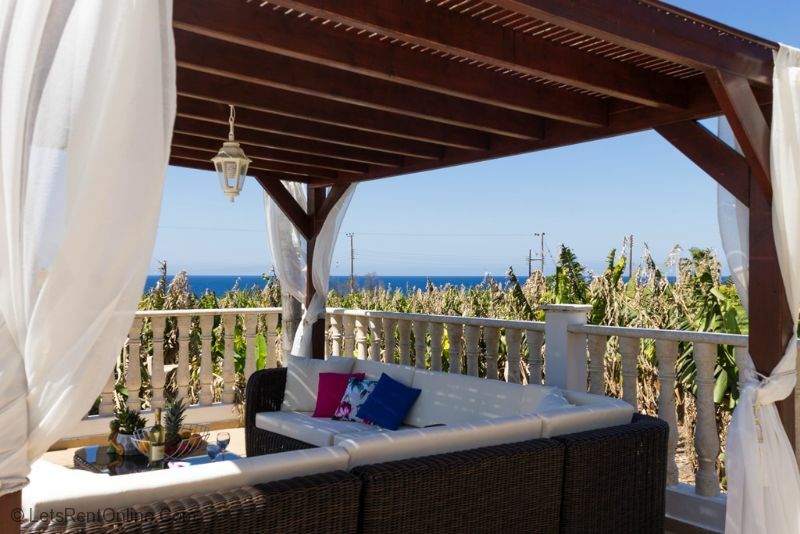 Now the Sea Caves area is one of the finest residential areas in Cyprus, offering some of the most exclusive villas in the island. 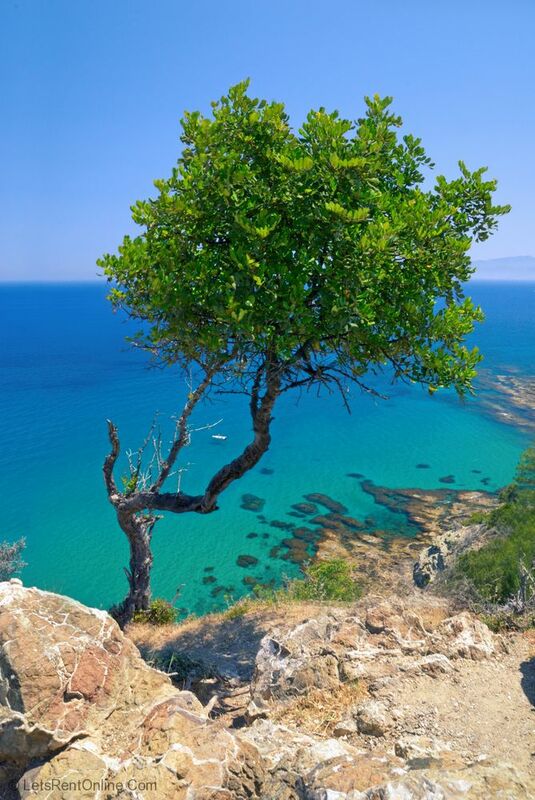 This is not surprising when you consider its breathtaking rugged Cypriot coastline and small sandy coves with crystal clear Mediterranean waters. Sunsets in the region are simply magical. Proceeding along from the Sea Caves you come to the pretty, tiny picturesque fishing harbour of St George with a small sand/shingle beach. 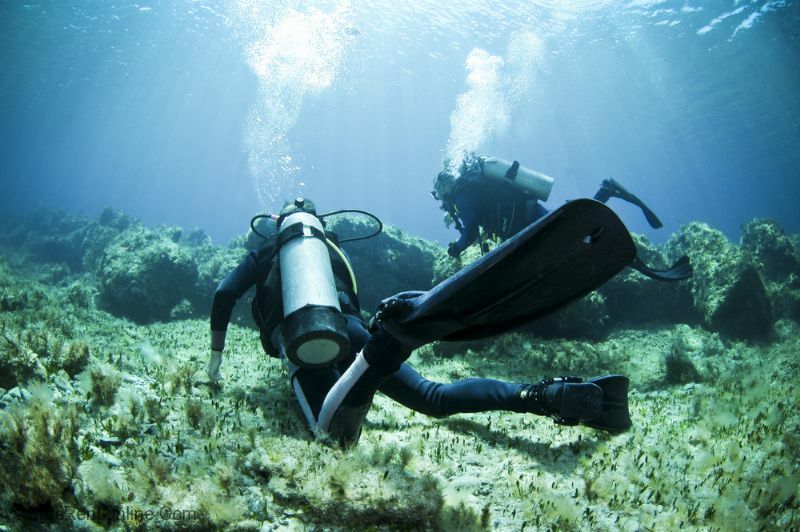 St George (Agios Georgios), like Sea Caves, is a perfect spot for snorkelling and scuba diving or topping up your sun tan. We strongly recommend tasting the local speciality "fish meze" in one of the selection of small family run tavernas at St George and the dramatic sunsets are worth the visit alone from any area of this amazing coastline. 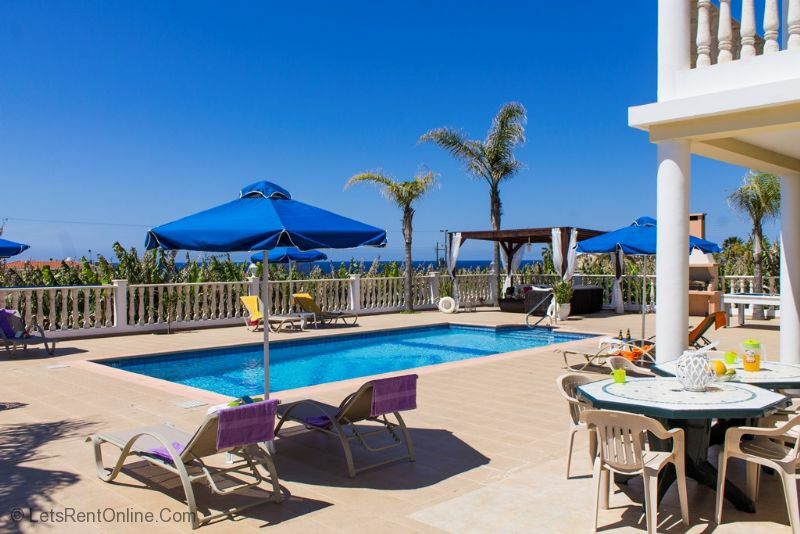 Situated 12kms from Paphos on the west coast of Cyprus and just 3km from Sea Caves, Coral Bay is a delightful resort renowned for its superb (blue flag) sandy beaches. 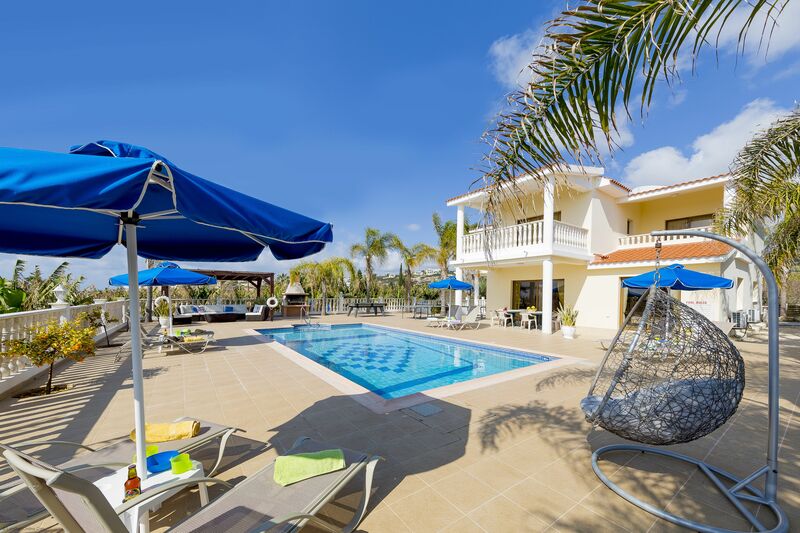 The main thoroughfare of Coral Bay is lined with a small but ample selection of shops, restaurants, banks and bars giving you everything you need for a relaxing holiday without losing any of its local charm. 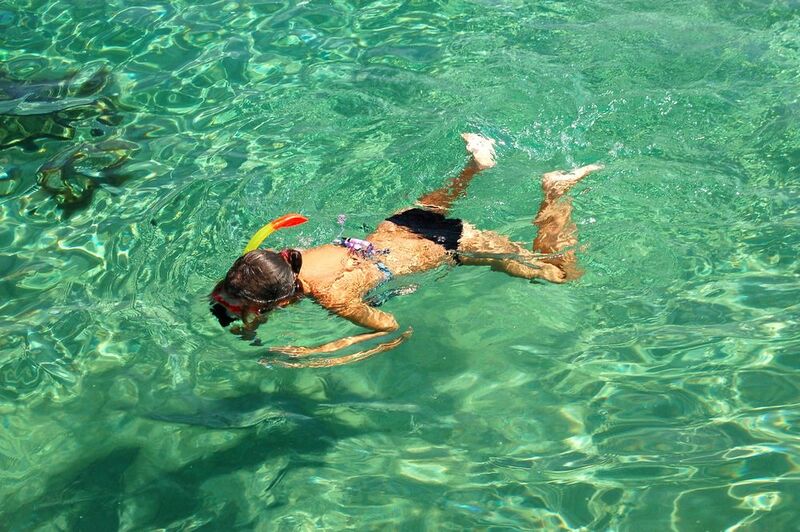 Life in Coral Bay tends to be based around the sandy bay with calm shallow waters, also offering a wide selection of water sports, it is perfect for a day out for all the family. 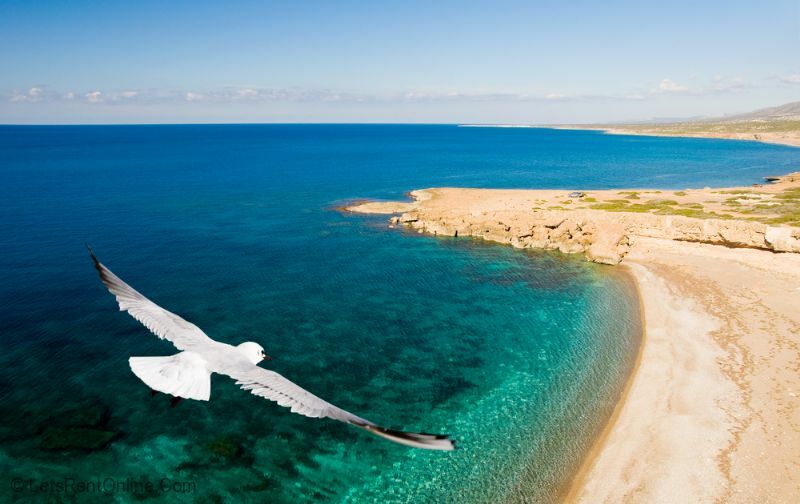 Other things to do in the area include Paphos Zoo, Horse Riding, Akamas Peninsular & Lara Beach Nature Reserve (famous for turtles), Hiking/Walking, Buggy Safaris, 4 x 4 Safaris, Sailing and many more. 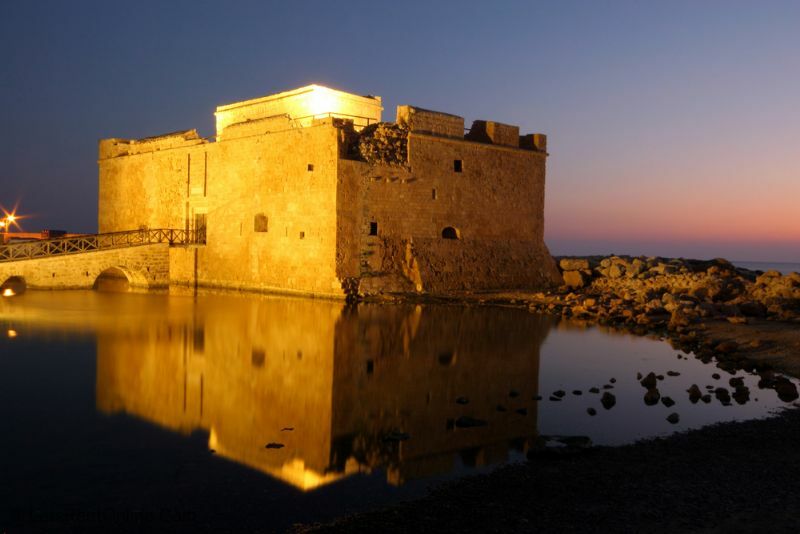 Amusement and water parks in Paphos are also easily accessible from the area, as are numerous archaeological ruins such as the Tombs of the Kings the mosaics and the Christian Catacombs. If you want to get out and explore some fantastic scenery, take a trip to Polis, Latchi or even Troodos mountains. Troodos is of course the main mountain range in Cyprus, not many people know that in the winter....you can ski! A Baby Cot and High Chair can be supplied upon request. Weekly Cleaning and Linen Changes. Up to 30 guests (including occupancy of the villa) permitted. 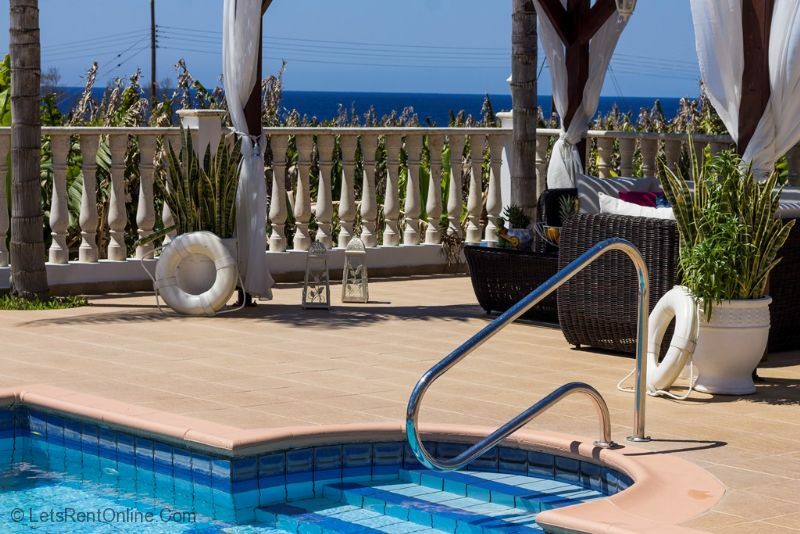 Refundable security deposit payable of GBP 500 to cover any damages or breakages at the property. 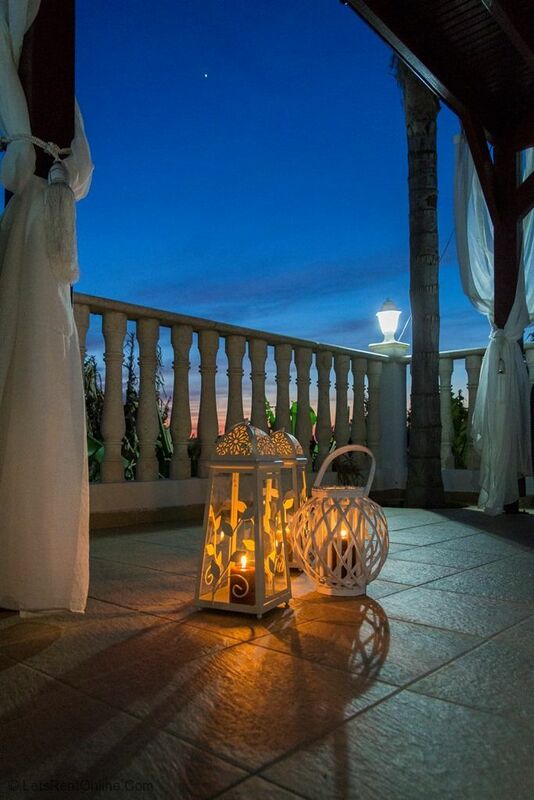 A wedding surcharge of GBP 200 is to be paid in advance together with the balance payment of the villa booking. A clean of the outside areas is carried out the morning after the wedding by the villa's cleaning team and is included in the surcharge.